Our Linux time tracking application was built to run natively on a wide variety of Linux distributions. It is lightweight, installs in seconds, and has the ability to run silently in the background. We provide simple but effective time tracking tools for Windows, Mac and Linux. Our lightweight desktop timers record screenshots, and activity levels so you can monitor your remote team. Here is an image of the time tracking app for Linux. It is built to run natively on Linux. From the Linux desktop application your remote team can select specific projects to track time to, stop and start time, add notes, measure activity levels and take randomized screenshots. All of this data is uploaded directly to the web portal where managers can login to view it. If your remote team needs to add work notes they can do it through the Linux application directly. The Linux time tracking app can be operated from the widget as shown above or directly from the menu. 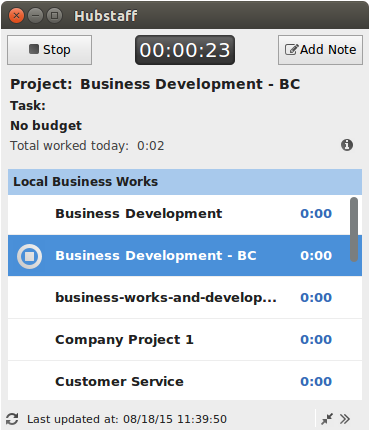 From the menu, users can stop and start time, select projects, add notes, take screenshots and more. Hubstaff runs as an application on the desktop making it easy to track time. Once the time is tracked you can invoice clients, pay employees, see in-depth reporting and much more. Over 8,000 remote teams use Hubstaff daily.